Better than WT's new stadium? Nothing is better than WT's new stadium, and I mean nothing. Not even Kyle Field itself. Aaaaaand for everyone who is curious, we'll get "a front row seat of the progress on the new structure as it continues to take shape in the coming weeks." Will the renovation include a special section for these guys? In all seriousness, since both are A&M schools and all construction plans have to pass the BOR at College Station I am convinced both Stadiums will be top notch for D2. 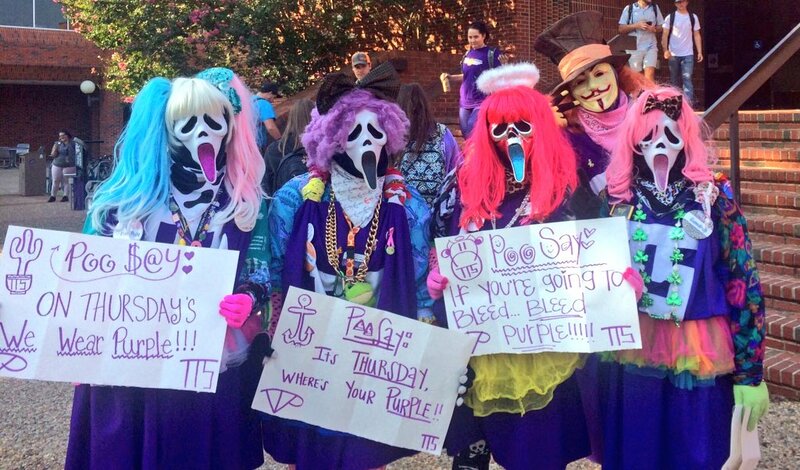 Tarleton shouldn’t have to spend as much since they are not starting from ground zero. But, that doesn’t mean TSU won’t have as many bells and whistles as the new WT stadium. Should be fun for LSC fans to make the road trips to these stadiums once they are finished. Already planning on traveling to canyon in two years for the game. I also need to add San Angelo on the travel list. Pictures don't do this thing justice. Hopefully renovations include updating the brick around the old press-box. Maybe even power-washing the entire east side like A&M did to their older sections of bleachers left after their renovation. Last edited by wisdomgymrat; 10-26-2018 at 10:05 AM. want to see Tarleton face-off against Mid-Western. beats everybody!! Beats VSU at home 47 -46. Mmmmmmmm. Jake says; "They are Big,Fast and Explosive.."
From what I watched against TAMUC they are massive on the O Line. Physical and push your D line into your LBs. if you commit too many defensive players to LOS, they can pass and are loaded with speedy receivers. Btw, did I say they are deep at the RB position. Defense appears to run a 4-2-5. But with 3 safety like players on field. DL is athletic and big. Only way I see Midwestern staying in this game is with turnovers, penalties and big plays from the passing game. Texans will win this one by 14 if not more. Just my thoughts from seeing both teams playing against the Lions. Just for fun I did the simulation of the game Tarleton vs SFA. This game was cancelled due to heavy rain and lightning. Game in Nacogdoches. Last edited by Techster88; 10-27-2018 at 03:01 PM. It will be a first rate stadium after the renovations are done no doubt. Next phase needs to address the Scoreboard (something like ASU's would be nice) and the 30+ year old field house. It was designed to be able to add a second level at some point, hopefully they can make it nice like what you see at Central Oklahoma. Good job on the facilities. Great things happen to programs who are proactive vs reactive in this area nowadays. I was told they are going to start on the current home side once they finish the new home side. Also, the two streets of neighborhoods just to the north of the stadium have been purchased. All, but a couple of homes to this point. Will add much needed parking. Great recruiting tool, when measured against other D2 programs. Last edited by Techster88; 10-30-2018 at 11:34 AM. I believe you mean south of the stadium. It will add much needed parking for a while. In the proposed 2020 vision it is the location for a Arena/Commencement Facility.